Many of you may remember the “Penny Catechism” from childhood days. I believe the second question in that little booklet was “Why did God make you?” To which the answer was “To know Him, love Him and serve Him, in this world, and to be happy with Him forever in the next”. It seems rather important, therefore, that we all have a duty to try and know God better, through Holy Scripture, the teachings of our Catholic Church and through prayer. The aims of the Development Group are: to continue developing further our knowledge of the Catholic Faith, and to increase that Faith, within our Parish Community; and by so doing, come closer to loving and serving God. Please note that the Development Group is here for you, the Parish. We are not a closed group with closed meetings. All the sessions we run of talks, reflection and prayer, are organised for your benefit, and we do hope that you all will try and attend these if at all possible. The Group currently consists of Father David, Emma Frankish, Catherine McCormack, Elizabeth Smith, Chris Pryce-Jenkins, Michael Bennett and Derek Stephens. We hold planning and review meetings on an as needed basis, which on average happens about 6 times per year. We are desperately in need of more members, and welcome anyone from the Parish who feel that they can help with our aims. We need your input, support and advice! For the Liturgical Year of 2016, which the Holy Father, Pope Francis, dedicated to Mercy, through the initiation of the Jubilee Year of Mercy, the Development Group ran a number of sessions on Mercy. In the Bull of Indictment, Misericordiae Vultus, the Holy Father asked the Church to focus on a number of areas, specifically, the Parables of Mercy, the Psalms of Mercy, the Corporal Works of Mercy, and the Spiritual Works of Mercy. Throughout this year, the Development Group ran several Friday evening sessions for our Parish focusing on these areas. The Holy Father also talked about the importance of Pilgrimage, and he decreed that "Holy Doors of Mercy" should be opened at all Cathedrals, and certain Basilicas and Holy Shrines. 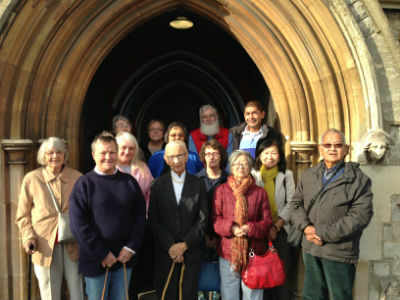 The Development Group organised a "mini pilgrimage" to the Holy Door of our Diocesan Mother Church, the Cathedral in Brentwood, in October, and 15 of our Parishioners were blessed to process through that Holy Door. As we approach the start of another Liturgical Year, and Cycle A of the Church Calendar, the Development Group is planning on running two sessions during Advent, to help us prepare for the feast of our Saviour’s birth. We anticipate that these sessions will be focused more on reflections on the readings for Advent, and will be structured more around reflection and prayer. Please look out for more details in forthcoming Parish Newsletters, and please try and include these sessions as part of your preparations for Christmas. On 22 October 2016, The Development Group organised a parish pilgrimage to Brentwood Cathedral and to the diocesan Holy Door. Fifteen parishioners were taken by mini bus and whilst there, they prayed for the parish and their own intentions and went though the Holy Door.